I have been thinking about Mary, lately. Mary, the mother of Jesus. I have been thinking about the Annunciation, when the Angel Gabriel announced to Mary that she would give birth to a son, but not just any son. She would give birth to the Messiah, “the Son of the Most High” (Luke 1:32). In all my days of Catholic school (13 years, in fact), I didn’t give a whole lot of thought to Mary. Maybe it was because, as a Protestant, it was somewhat taboo. Maybe it felt like dangerous ground to think about Mary too much - too close to worshipping her. But I think we Protestants miss out when we ignore Mary, when we don’t pay attention to her story and what she can teach us. And I find that, more and more, I need female role models from Church history to look up to, to learn from. I need examples of strong women who said “Yes” to God, who were powerful in their own time and in their own way. 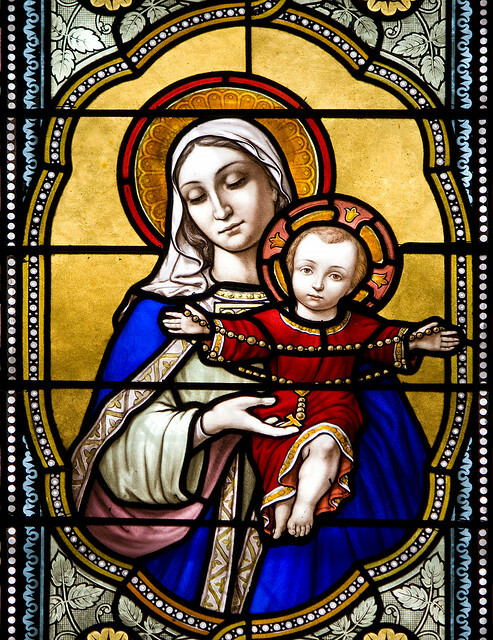 Thinking about Mary leads me to think about acceptance, about an open attitude of accepting what happens to us in life. About God’s working within the ordinary (and occasionally, extraordinary) events of our lives. When Mary, a virgin, is told that she will give birth to a son, she understandably asks, “How can this be?” But just as quickly, she responds, “May it be to me as you have said.” She accepts this strange, wonderful thing that will happen to her. Kathleen Norris (in Amazing Grace: A Vocabulary of Faith) says, “Mary proceeds—as we must do in life—making her commitment without knowing much about what it will entail or where it will lead.” She answers in faith, and that takes an inordinate amount of strength. What if Mary had said, “No”? How would our lives be different? How would her life be different? I imagine God would have found someone else to carry Jesus into the world. Mary would have avoided the pain and heartbreak of raising a child only to watch him eventually be tortured and hung to die on a cross. But she also would have missed out on being a part of something so important, monumental, and exciting, scandalous, even: God’s unfolding plan for her people, for the world. While we are not faced with the same weighty choice that Mary had to make, we make decisions every day that further God’s kingdom in the world, or hinder it. We rarely, if ever, know the outcome of the “yeses” we say--marriage, friendship, a job change, a move. The reality is that faith takes practice. We need to cultivate an attitude of acceptance daily, even when we don’t know the result of our commitments. Sometimes God’s will is clear, and sometimes it is very fuzzy. Sometimes we feel more in control of our decisions, and sometimes we feel only in control of our response. If we see Mary as our example, “we will be guided by a response that lets things happen according to the will and word and love of God. Nothing that will happen then need divert us and fellow pilgrims from this march of faith in daily life,” says Marty (from Places Along the Way, a favorite devotional of mine). So, today, let us live with openness and acceptance to what comes our way, let us take steps in faith, and then trust that we can be a small part of God’s plan. What are some ways that you have said, “Yes”? How can you cultivate an attitude of acceptance in your life? Micalagh Beckwith Moritz is a social worker, writer, wife, sister, daughter, community member, continually learning how to do a better job at each of these roles. She is always contemplating how to love others better and to enjoy the small things of life; to see God in everything and everyone. She is passionate about caring for the environment, experiencing new cultures, and also important, eating cheese. She currently lives in Belize and has the privilege of teaching and learning from college/university students! She works with a Christian study abroad program: Creation Care Study Program (CCSP). Micalagh blogs at Only Small Things.